Breaking a five-minute mile, breaking the 18-minute mark three times in my late 40’s (including this past October, two weeks before I turned 49), winning 33 races outright, winning the same race three times (Kilometers for Cancer), winning our first 17 team races in a row with my team, No Brain No Pain, surpassing 100 races (112 and counting) in under a decade, qualifying for six Second Seeds at Bloomsday, finishing in the top 100 (73rd, 75th, 76th, 79th, and 91st) on Doomsday Hill at Bloomsday out of over 50,000 racers each year, running twenty-two 5ks with my ten-year old son (Pierce) and eighteen 5ks with my thirteen-year old daughter (Trinity), coaching Holy Family Kirkland XC and Track to multiple CYO team championships over the past eight years, running over 49,000 miles since 1988 (will surpass two trips around the Earth this fall), and finally, winning the inaugural Coaches’ Mile in the 2015 CYO XC Championships in 5:23 (at 46) and having my entire XC team run the last 150 meters with me!!! Started running in 1989, after a highly successful collegiate ski racing career at Stanford University. Needed to keep my legs busy, my asthma at bay, and recover from surgery on my left knee. Ran non-competitively for about a dozen years and ski raced competitively again from 1998-2001. 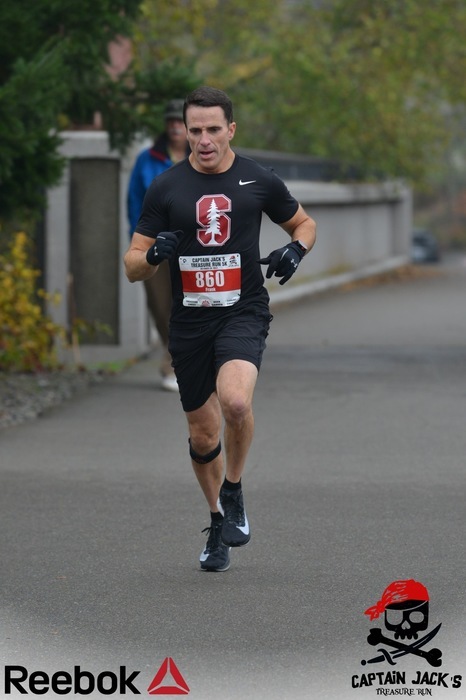 Had reconstructive surgery on my right knee in spring of 2001 and was told that I shouldn't run again, SO I spontaneously ran the Seattle Marathon in 2001. Continued running 30+ miles a week until 2008 when I started keeping track of my times and decided to run a second race, the Super Jock N' Jill 4.5 mile run -- I finished strong and was addicted. Since then, I've run 112 races (5ks, 8ks, & 12ks) -- I've won 33 of them outright, placed in the top three overall 44 times, in the top ten overall 77 times, and in the top three in my age group 102 times (taking first 70 times). I formed a racing team, "No Brain, No Pain", in 2012, and we've won 17 of the 18 races we've entered (taking 2nd in race #18)! You can find me on Athlinks.com!